Rub 1/4 cup ghee into the flour and knead into a stiff dough with water. Cover the dough with a damp cloth and keep aside for thirty minutes. Sauté the khoya over medium heat till it looks slightly fried. Take the pan off the heat and when it cools, mix in the sugar, cardamom and almonds and mix well. Let the mixture cool down. Shape the filling into ovals about 21cm length and 1 cm thickness. Make balls of the dough and roll out into 1 cm/1/8 in thick rounds. Put a few tbsps. of the khoya filling on one side. Apply small amount of water on one side of the outer edges. 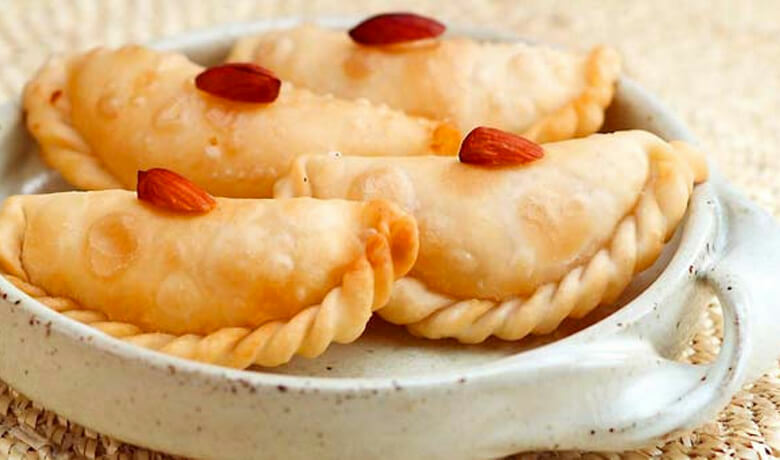 Cover and press the edges together and cut the excess dough from the edges with a pastry cutter and pleat the gujiyas neatly from the top to the end. Continue this until mixture and dough has been used. Deep fry the gujiya in moderately hot oil until they are golden brown. Drain the gujiyas on kitchen paper towls to remove excess oil. Voila! Your gujiyas are ready to be served…make sure you have a sneaky one or two before though!